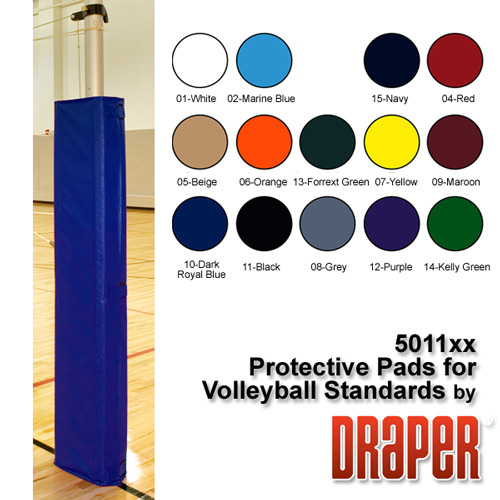 Our volleyball upright pad protects your players from impacting with the steel uprights of the volleyball system. Protect your players from injury, but the protected upright pad today! One pair of upright pads for standards provides maximum player protection. Our 6" (152mm) high pads are constructed of 1-1/2" (38mm) thick, cross-linked polyethylene foam filler covered with polyester reinforced vinyl fabric. Each pad consists of two vertical sections that attach to each other with hook and loop fasteners for a quick, easy setup. Each section is hinged at the corners to fold neatly around posts and tensioning winch. Protective Pads work equally well when incorporated with a Judges Stand or Center Standard Kit. Royal blue is standard, other colors available. (Last two digits of part number indicate pad color).